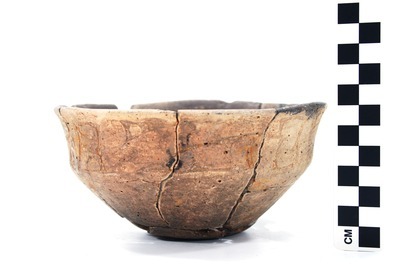 "41UR315, 2003.08.1836" by Timothy K. Perttula and Robert Z. Selden Jr.
DECORATION (INCLUDING MOTIF AND ELEMENTS WHEN APPARENT): The rim panel has an engraved scroll motif that is repeated four times around the vessel. The scroll itself is open, with no central scroll line, and the scroll dividers have large negative S-shaped scrolls outlined by excising. The upper and lower scroll fill zones have sideways negative S-shaped elements outlined by excising. Ripley Engraved, var. Gandy carinated bowl, Vessel No. 2003.08.1836.